Almost all the core banks recorded a positive bottom-line result for Q4 and turned profitable for the whole year. This came largely on the back of sharp drop in impairment losses, cost containment, modest net interest income (NII) growth and stronger rebound in fee income. At the same time, the negative non-performing loan (NPL) and non-performing exposure (NPE) formation coupled with write-offs led the respective stocks down from the previous quarter. In addition, loan deleveraging continued in Q4, while deposits improved. However, all banks stressed that the positive asset quality and liquidity developments during the last quarter of 2016 were interrupted in Q1 2017 amid weaker sentiment and uncertainty related to the delay in the conclusion of the second programme review. 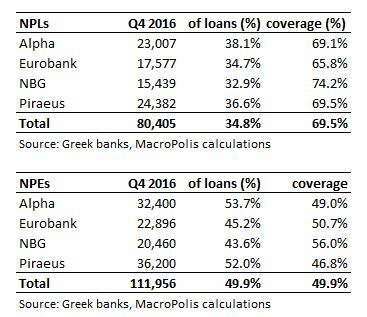 All banks posted negative NPL formation in Q4, which climbed to -1 billion euros in Q4 from -90 to -100 million in the previous two quarters. 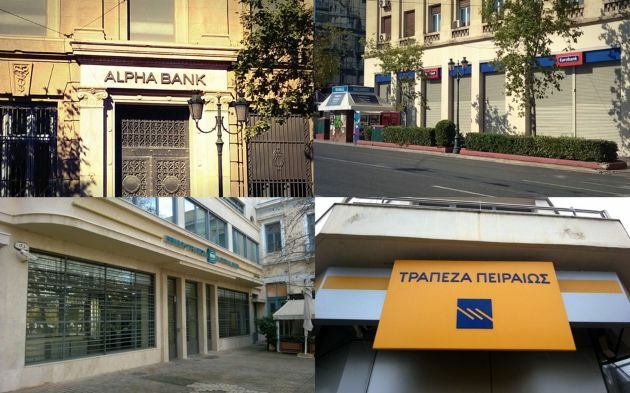 At the same time, three of the four banks also recorded negative NPE formation in Q4, while only one (National Bank - NBG) had already produced a negative figure in Q3. Therefore, both the NPL and NPE stocks fell in Q4 on the back of negative formation and write-offs. Specifically, the NPL stock was reduced by more than 2.2 billion QoQ to 80.4 billion euros, with the NPL ratio landing at 34.8 percent, while the cash coverage ratio edged up to 69.5 percent. As expected, the NPE pile fell at a slower rate than NPLs. It declined by 1.6 billion euros QoQ to almost 112 billion, while the NPE and the respective cash coverage ratios stood just shy of the 50-percent mark. The Bank of Greece (BoG) said on February 24 that Greek NPEs fell by 1.4 billion to 106.3 billion at the end of Q4 mainly due to the implementation of more effective workout solutions, also leading to higher cure rates, coupled with write-offs. Despite the apparent deterioration in Q1, banks appeared confident about meeting this year’s NPE reduction targets if there is a swift conclusion of the programme review. Although impairment losses rose by 12.7 percent QoQ in Q4, the full-year figure fell by almost 72 percent to 3.58 billion from the exceptionally high figure of 12.7 billion in 2015. In addition, the cumulative stock of provisions increased to nearly 56 billion at the end of 2016, corresponding to almost one quarter of gross loans. Deposits increased by around 7.3 billion for the four banks during 2016. Of this, almost 5.3 billion was recorded in the last quarter of the year, also supported by the seasonally high inflows in December. At the same time, reliance on Eurosystem funding dropped by 8.7 billion euros QoQ to 66.6 billion at the end of December, with Emergency Liquidity Assistance (ELA) and ECB funding down by 3.9 and 4.8 billion respectively. However, this positive trend was reversed in Q1 with Bank of Greece (BoG) data showing deposit outflows of 2.3 billion in the Greek market in the first two months of 2017, while negative flow is also expected for March, as depositor sentiment was harmed due to the inconclusive discussions on the second programme review. Despite the negative deposit trends evident in the 2-month period, Eurosystem funding continued heading south, decreasing by 4.7 billion over this period and mostly driven by lower dependence on ECB funding (-4.2 billion). ELA funding edged down by just 500 million. The latter reflects a reduction of 850 million euros in January, followed by an increase of 330 million in February for the first time since April 2016. It is worth noting that the lower dependence on ECB funding in the last five months largely reflects a shift towards interbank repos, mostly via EFSF bonds. NII stayed almost flat QoQ in Q4, while the full year figure edged up 0.9 percent. The NII performance is mainly driven by lower funding costs related to decreasing time deposit cost and the declining wholesale funding expenses (due to reduced reliance on ELA funding), which was almost offset by weaker lending NII on loan deleveraging and spread compression. For 2017, banks estimate NII to stay almost flattish as the trends evident in 2016 are expected to be maintained this year. Moreover, commission income rebounded 6.5 percent QoQ and grew at a double-digit rate for the whole year, mostly on lower government guarantees’ expenses (related to pillar II bonds) coupled with increased usage of cards and money transfers. A further rebound in fees for similar reasons is expected for 2017. At the same time, operating expenses fell by 3.2 percent in 2016 mainly due to lower personnel expenses reflecting the implementation of voluntary retirement schemes. Cost containment is broadly expected to continue in 2017, albeit at a slightly slower pace compared to that recorded in the previous years. Greek banks remained adequately capitalised with the Common Equity Tier 1 (CET1) ratio close to 17 percent on average at the end of 2016, while the fully-loaded Basel III ratio ranged between 13.8 percent for Eurobank up to 17 percent for Alpha. They also disclosed for the first time the Supervisory Review and Evaluation Process (SREP) overall capital requirement (OCR) submitted by the Single Supervisory Mechanism (SSM) for 2017. This stands at 12.25 percent for Alpha, Eurobank and NBG and at 13 percent for Piraeus, also reflecting the delay in the appointment of a new CEO at the latter lender. SREP is calculated by the SMM and is tailored to each bank’s individual profile after the examination of each bank’s business model, governance and risk management, risk to capital and risk to liquidity and funding. The tangible equity (TBV) of the four banks amounted to 28.4 billion at the end of 2016. Around 20 billion (70 percent of total) relates to deferred tax assets (DTA). Taking into account that their market capitalisation stands at around 7.4 billion, Greek bank stocks trade 0.26x their TBV. An amendment that was voted in Parliament at the end of March allows banks to amortise losses arising from write-offs or loan sales over a 20-year (from 5-year previously) period. This would facilitate the banks’ efforts το reduce their NPEs by 37.6 percent (or by around 40 billion) by 2019 as targeted without potential losses harming their capital base. The single most important factor for Greek banks going forward remains the effective management and reduction of their NPE balances in line with their committed targets. The first step in this challenging process is certainly the swift conclusion of the second programme review and the voting of the pending legislative actions (out-of-court workout, e-auctions, etc) that are necessary for Greek banks to effectively address their long-standing asset quality issues. I am not sure anyone would care or should care about the Greek banks any longer. Not only they have proven to be a Trojan horse in the harsh subjugation of Greece from the eurozone dictatoship but they serve very little in promoting the Greek economy in any significant way. The main source of bank revenue at this stage is the Greek state itself as banks enable the issuance of 3-month and 6-month short treasury paper which Greece constantly recycles as an alternative means of financing. Most of the private borrowers are not credit worthy anyway so I see absolutely no reason why Greece should have any more than 2 banks given the lack of depth in the Greek market. In their current condition Greek banks are nothing more than enablers of internal administration for the state since all pensions are directly deposited into bank accounts plus banks are a constant source of worry for potential bail-ins and harsh controls on depositors liquidity. In such an environment I see no reason for a healthy Greek banking sector unless of course you are Troika and you want Greece under occupied condition and devoid of any options other than complete and total obedience.